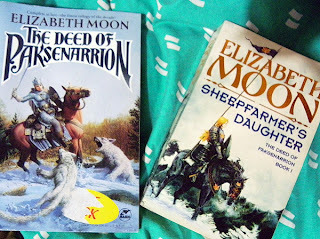 The Deed of Paksenarrion by Elizabeth Moon, is often held up as one of the classic feminist novels of high fantasy literature. It deserves that place. I highly, highly recommend this book - and yes, 'Heir to Middle Earth', as it has been grandiosely titled inside, by Judith Tarr, is actually quite apt. It is actually a large volume of three books - The Sheepfarmer's Daughter, Divided Allegiance and Oath of Gold. And like all of Elizabeth Moon, Queen of Lesbian Subtext's books, it is often suggested when people go looking for lesbian fantasy. The Deed of Paksenarrion follows the story of Paks as she runs away from her tiny rural home of Three Firs when her father decides to marry her off, signs up with an honourable mercenary company belonging to Duke Phelan, and goes soldiering. She's brave, and just, and kind, and very naive, knowing little about the world. She sees everything in black and white, struggling to be liked and too willing to trust her superiors. She's also exceptionally tall, strong and a good fighter, side-stepping neatly the entire 'women are biologically weaker' issue! She also appears to be under the protection of Gird, a soldier-saint who was the focus of a prequel book, and who is the centre of one of the many religions - but not the religion of Paks, who has trouble believing that Gird is helping her. Through her skill and courage, she rises in the ranks and plays the hero on several occasions, but by the end of the first book, she's suffering as she acts against her morals, and takes leave from the Duke's Company to decide what she wants to do with her life. From there, she goes adventuring, gets caught up in elf magic and evil priests, and eventually starts training to become a Paladin of Gird. For the story... it has been described as Tolkien's world rewritten, and it easily could be. Except, instead of following hobbits and elves, we're off embroiled in the petty struggles of Men, within little trade kingdoms. Occasionally elves and dwarves wander through, and are very Tolkienesque, but while clearly inspired, they don't borrow heavily for names and history and attitude. And the religions are different, of course - most accept the existence of the High Lord, and then follow a specific sub-deity or saint. An odd mixture of old Pagan religions with multiple deities, and ones with only a single focus, as they accept the others fairly peacefully, but dedicate themselves more or less to a single religion and deity. If you've read George RR Martin's A Song of Ice and Fire series, the story, setting and quality is similar - but it is far less character driven (or at least, it only follows one character, while ASOIAF brings life to many). Incidentally, ASOIAF is an amazing series of books, and I'm actually hoarding the most recent one I own, so I can read the next one straight after it. For lesbian content... there's not much, openly. If anything, Paksenarrion is asexual, or at least confused, she has no interest in sleeping with anyone and mainly wishes to be a warrior. There is a conversation near the start, where her sergeant, Stammel asks her if she's a 'sisli'. "I don't know what that is", she replies. "A women who sleeps with other women" is the answer. But no, she's never really thought about it. This, and a bit of subtext throughout the book, leaves it very open that Paks might be lesbian - or she might simply not be interested in anyone. Two of her mercenary companions - Barra, a short-tempered and fairly unpleasant character, and Natzli, her quiet and peaceful shadow, are named as being lovers and treated no differently than any other character. Unusually, for a story of war and fighting and death, they both survive until she leaves the company! Women are, at least in the North, quite commonly found as fighters (about a third of the various armed forces), although men are commoner, and the rare female captain or other leader is always commented on. Shared quarters are quite normal, and there's no obvious discrimination. One reason it's so well known is that it that it is a very good book, another is that it was published in 1992, and so stood out a bit for the matter of fact inclusion of any lesbian content at all. Also, Elizabeth Moon tends to write lesbian subtext (although she's more interested in writing strategy, weapons training, politics and ethics) so people know to look! Elizabeth Moon has gone on to write other books, mostly science fiction in a fast growing series in space. Most of her protagonists are women, and often have lesbian subtext, but as a rule, she doesn't focus on it, simply lets it be there if you look.